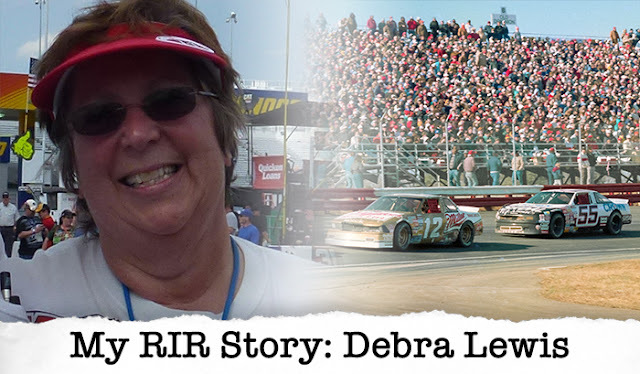 Debra has a lot memories from attending races at RIR since the 1980's. Debra Lewis is a diehard NASCAR fan, and has done her part to share that fandom with friends old and new. She shares her Richmond experience as a part of the "My RIR Story" series. The first time I visited Richmond International Raceway was in the mid-1980s. I went with my boyfriend, who is now my husband, and remember telling him that he had to pick a favorite driver before we went. I was a Terry Labonte fan, and he wound up picking Dale Earnhardt (Sr.). You have to love the competition. I’ve been to Richmond so many times since then, and going twice a year provides the opportunity to collect a lot of memories. I remember Richard Petty getting on a backhoe in 1988 after the race when they expanded the track. That man can drive anything. My favorite memory though, was when Terry (Labonte) won in 1994. I was a member of his fan club and made posters for every race. One weekend at Richmond, I even got to meet him. I’d gotten garage passes and when we met he invited me to his hauler and I got a picture with him. There’s six of us that go to every race, but we use two of our tickets to bring someone new. This past September I brought a couple that we used to be very close with, but hadn’t seen in about 25 years. My husband and I had gone to their wedding and even drove them to the airport for their honeymoon. While we’ve kept in touch, we hadn’t seen each other in person in a long time. Thanks to RICHMOND NATION, we could go on the track early for Gridside Live!, and this couple had never seen anything like it. They had never really experienced a NASCAR race weekend, so it was special to share our moments with them. 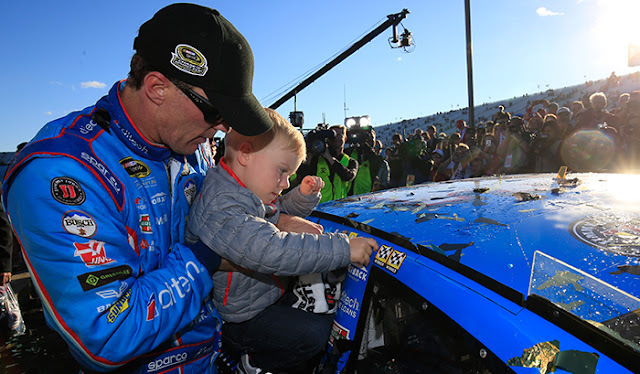 Over the years, we’ve seen more and more families come to the track. I enjoy seeing all the kids at the track and think the race is a kind of “family get together.” Being a part of RICHMOND NATION makes the experience even better. It makes me feel special, like I’m a part of a unique and exclusive group. Racing is in the blood of Timothy Wilson, and he's been able to pass that passion along to his daughters through his RICHMOND NATION experience. He shares his Richmond experience as a part of the "My RIR Story" series. I’m the type of person who likes to be a part of something. When I read about RICHMOND NATION online and discovered how I can enhance my experience at the track, I knew I wanted to get everything I could out of being a member. When we attend a race weekend, it’s about more than just what happens on track – we’re there to see the drivers do Q&As, enjoy the food, and buy souvenirs. RICHMOND NATION enhances myexperience. Certainly having our seats locked in each year is a great benefit. We love our seats and like all the fans who sit around us. It’s like a reunion every year when we get to see them. We get a free parking pass which I enjoy, along with the RICHMOND NATION receptions and drivers doing special Q&As. The parking and special events were why I joined, but I enjoy ALL of the benefits of RICHMOND NATION. My first race was with my best friend when I was 12 years old. His father was a Henrico County Police officer, and he let us explore while he worked. It became a tradition, and each year we had one more friend show up. At that age, you remember the highlights. Seeing the wrecks and then the people you see on TV. I don’t think I missed a race until I went to college. After graduating and marrying my wife, I joined the Kiwanis who would volunteer at the track each weekend to raise funds for the Children’s Miracle Network. This was my way of getting back into the race track, which I did for many years until I moved away from Richmond. Though I had a great time at the track with my friends growing up, it was more fun to start a new family tradition with my daughters. In 2002, my Father’s Day gift from my wife and daughters was tickets to the race. It was touching to see my younger daughter get so into it, and seeing in her eyes the same look I had back when I was 12. She’s caught the NASCAR bug. The horsepower and the noise is something that gets into your blood. It is something I hope becomes a life-long passion. You can’t make anything better than that. 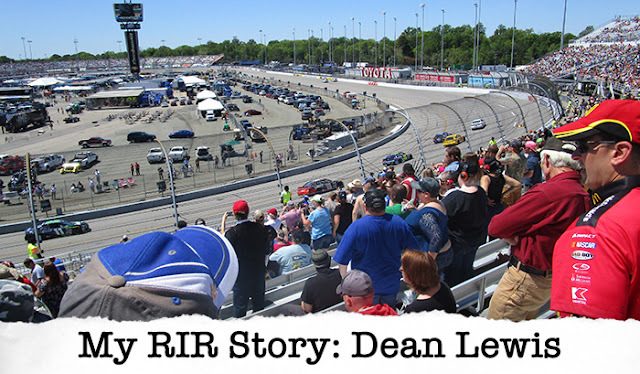 Dean Lewis has been watching races from RIR's Dogwood Section for over 30 years. Dean has been coming to Richmond International Raceway since 1974, and camping with friends and family is one of his favorite traditions. 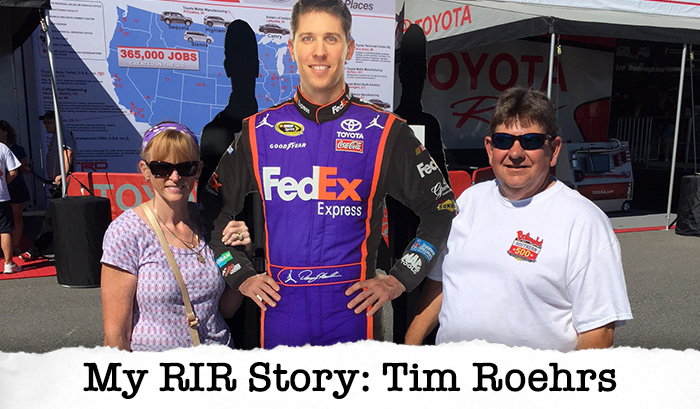 He shares his Richmond experience as a part of the "My RIR Story" series. Richmond is my favorite track. I’ve been to a lot of other tracks: Martinsville, Talladega, Daytona, Dover and Pocono. But Richmond is always different, especially the NASCAR season finale in September. A race I will never forget is Kevin Harvick’s victory five years ago. I started out as a Junior Johnson fan when he was in the Budweiser car, and wherever that car went I would follow. I remember thinking (Dale Earnhardt) Jr. was going to be the greatest thing, but it was Harvick who sealed the deal for me. My youngest son and best friend have been coming with me to every race for the last 20 years. I have three other friends who join us, too. We used to spend a lot of time together many years ago. While we’ve all somewhat moved in different directions of life, we still get together every race. The six of us have three campsites together right outside of Turn 1 and 2 in Lot F. It’s always a great weekend. I love RICHMOND NATION because it locks in my seat every race. Most of the people in our campground sit around us in the Dogwood section in the same spot every year - and I love our seat. Being in RICHMOND NATION means we get to be at the race no matter what. The fans who go to the races at RIR are really nice, and the track staff is great. I’ve never run into anyone with a bad attitude - even if their driver lost. Where else can you go where so many different fans and teams are together and still have a great time? A NASCAR race. 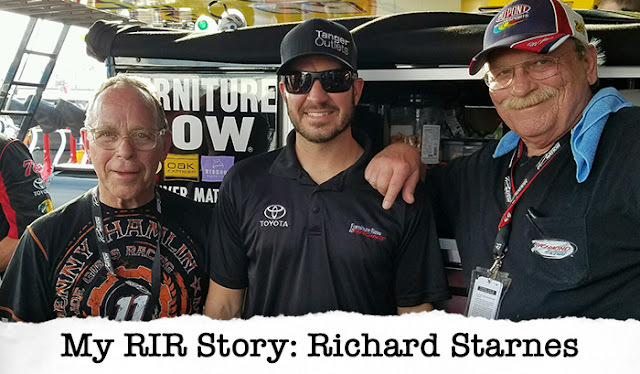 Richard has been coming to Richmond International Raceway for nearly 30 years, but this past September was his most memorable race ever. 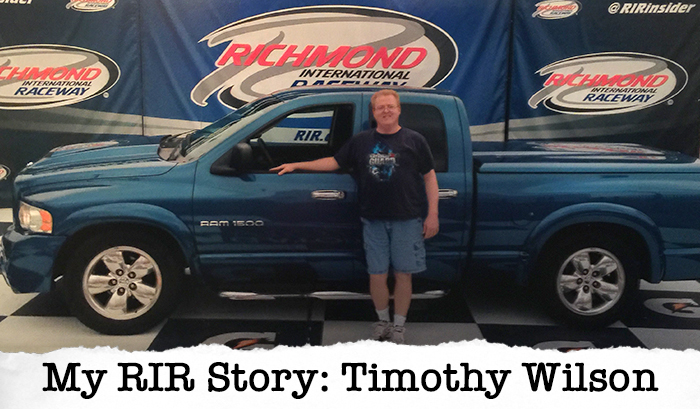 He shares his Richmond experience as a part of the "My RIR Story" series. I may not remember my first race at RIR, but I’ll never forget my favorite. Without a doubt, my best NASCAR experience was this past September thanks to an experience with Martin Truex Jr. during Fan Appreciation Weekend. Through an RIR sweepstakes, I was invited to a race day meet and greet with Martin. I made it on television while he was being interviewed, visited the hauler and also toured the whole garage. It was very special and I'd never had a race experience like this before. I'm a long time Jeff Gordon fan, but I've definitely been paying more attention to Truex since that day. I’ve been to other tracks, but the fact you can see the whole track from my seat in the center of the Frontstretch is amazing. I enjoy the racing action at Richmond, and for me it's one of the best experiences in NASCAR. It's easy to pass so drivers can race side-by-side for long stretches at a time. We have always arrived early to the track on race day. But since we joined RICHMOND NATION, we can park right next to the entrance for a great day of tailgating. In fact, I'd say it's the best tailgating in the sport. I have been a season ticket holder long before RICHMOND NATION started. When RIR rolled out the program with special perks like parking, it was only natural to take our experience to the next level. Sandy and her husband Barry at a NASCAR Cup event in Richmond. 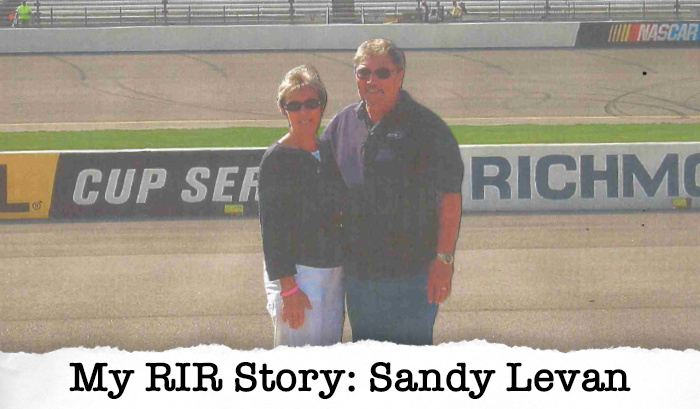 Sandy is lifelong NASCAR fan who works part time in the Guest Services department at Daytona International Speedway. 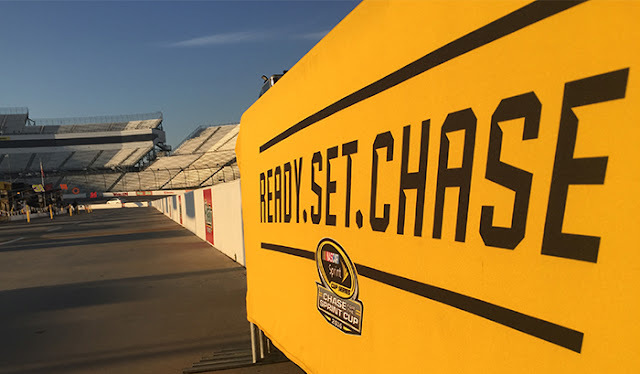 She shares her Richmond experience as a part of the "My RIR Story" series. My favorite memory of Richmond was my Dad’s first race in 1997. He was an avid NASCAR fan, but wasn’t someone who liked to travel. I convinced him to come with us to RIR for a race. My Dad and I bonded during the race by running to the track to watch drivers practice every time we heard an engine fire up. It was special for us. Our favorite driver, Rusty Wallace, even ended up winning the race. My husband Barry and I first came to Richmond in 1994. We had been to Daytona, but we always wanted to go to RIR. I was impressed with the excitement of seeing the racing action on the track. When we moved to Daytona in 2009, we decided to continue making trips to Richmond for races. After about 10 years on the wait list, we finally got a site in the Main Campground at RIR. We love that RICHMOND NATION makes sure we can keep our camping spot. I don’t have to worry about losing my seats or camping as I have them every year. The program makes us feel part of the RIR family. I’ve been a NASCAR fan all my life. Racing is my real passion as I enjoy the competition on the track. It takes a lot of skill to get around RIR. We enjoy the action at Richmond! I feel honored to be part of the International Speedway Corporation family. I’m already excited for 2017! Below is a first-hand account from a RICHMOND NATION member about their year as a season ticket holder. That was my reaction when Richmond called to tell me I'd won a trip to NASCAR Champions Week in Las Vegas. I'm so excited to go, and have RICHMOND NATION to thank for getting me there. Normally, the general public does not get into the banquet, so being able to see the celebration of (Jimmie) Johnson's seventh championship will be fun. I'm not the biggest Jimmie Johnson fan - Kyle Busch is my guy, and I'll cheer for Denny Hamlin too - but you have to be excited for him, that's a major accomplishment. I've been going to races since 1998, but my first race in Richmond was the fall race in 2007. I was on the wait list for tickets for years before I finally got some. 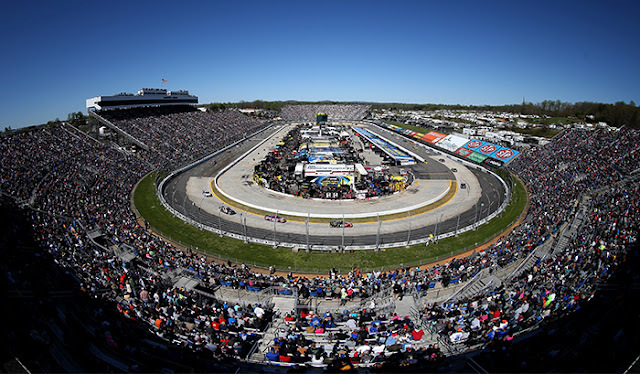 You always heard about how Richmond was one of the best tracks for fans, for the excitement. It lived up to its promise! I drive for FedEx and it's not always easy getting many Saturdays off, so I'm not always able to go to the spring race in Richmond. With it being changed to Sunday afternoons last April, I was able to go to both races, and (it) was an awesome race - one of the best races of the year. To go on the track before the Fall Race and see some of the drivers at Gridside Live! was very exciting. RICHMOND NATION is a really good deal, (saving money on) both races and having events on race weekend and throughout the year. My wife Hope is actually the one who got me into NASCAR, and every year it's something that brings my family together. We get together with my youngest son in Charlotte, some neighbors and good friends and travel up to Richmond for the races. We all hop in an RV and we're off. To me, that's the most important part of being a NASCAR fan. The thrill of being at the track with family. There's nothing like it, and you can't describe it. You've got to go experience it. Richard Petty. Dale Earnhardt. 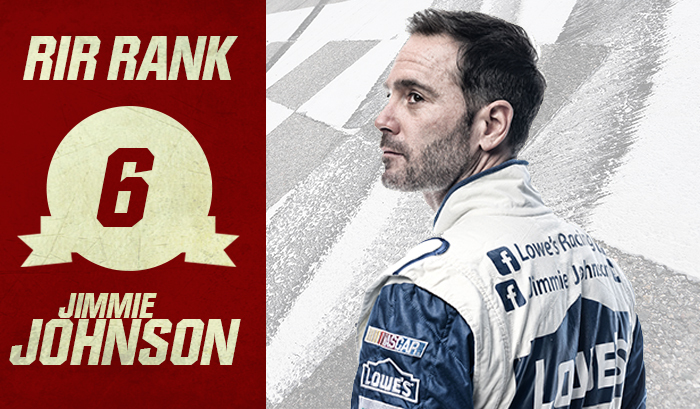 Jimmie Johnson. The Hendrick driver joined elite company on Sunday, as he claimed a historic seventh Cup Championship - joining the two Hall of Famers as the only drivers to accomplish such a feat. 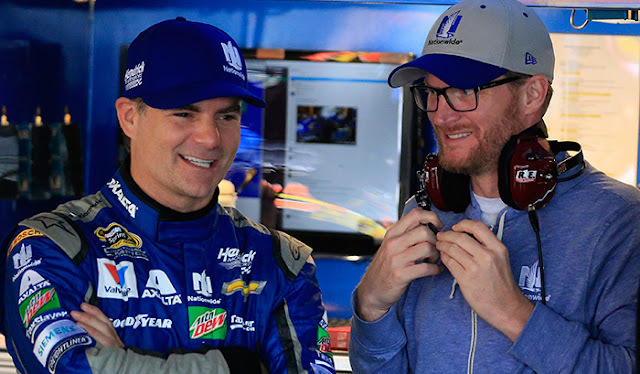 "I was driving the same race cars for the same team as Jimmie and getting beat by Jimmie," said former teammate Jeff Gordon. "To me, he’s the best I’ve ever seen." It didn't come easy for Johnson, who worked his way up from the back of the field before claiming the lead during the final overtime restart in NASCAR's thrilling season finale. "Just beyond words," said Johnson. "Just didn't think the race was unfolding for us like we needed to do to be the champs, but we just kept our heads in the game." 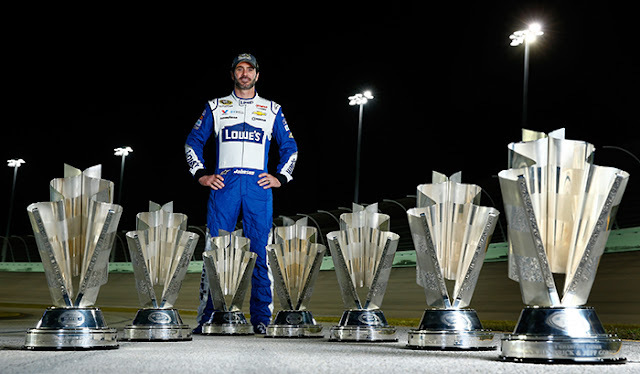 Twelve wins, 3,769 laps led, four Chase drivers, and two in the Championship 4. Yes it was Jimmie Johnson hoisting the Sprint Cup trophy on Sunday night, but 2016 could be remembered as the year Joe Gibbs Racing established itself as a premier team in NASCAR. Their historic season propelled Toyota to their first ever manufacturer's title in the Cup series, snapping Chevrolet's 13-year winning streak. If you throw in the accomplishments of alliance member Martin Truex Jr. (another four wins and season-high 1,809 laps led), his future teammate Erik Jones, and an XFINITY Series Champion in Daniel Suarez - what team has a brighter future? Speaking of futures, 2016 proved that NASCAR has a promising one. The 2016 Chase field saw four newbies all under the age of 27. Rookies Chase Elliott (20) and Chris Buescher (24) joined Austin Dillon (26) and Kyle Larson (24) as first-time Chase competitors, with Elliott advancing to the Round of 12 and Larson having arguably the best car at the Championship race in Homestead. Rookie Ryan Blaney (22) had a strong campaign with nine Top-10 finishes, while Team Penske's Joey Logano (26), has established himself as one of the sport's most dangerous drivers with nine wins over the past two years and a Championship 4 run in 2016. Furniture Row Racing signed Erik Jones (20) to a full-time Cup ride in 2017, and his XFINITY Series teammate Daniel Suarez (24) took home the XFINITY Series Championship. Watch out next year, folks, these youngsters mean business. This season was definitely one for the books, punctuated by Denny Hamlin's historic start at the Daytona 500 and Jimmie Johnson's historic finish at Homestead-Miami Speedway. And while the sun has barely set on the 2016 season, already the NASCAR landscape is beginning to change. What will the Cup Series look like without Tony Stewart? 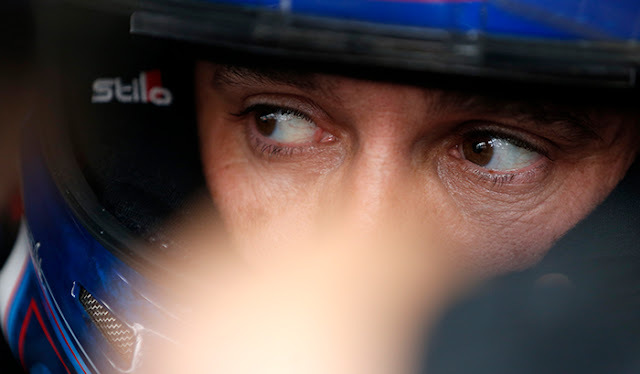 How will his team, Stewart-Haas Racing, perform with their transition to Ford? Will 2016 go down as a career year for Joe Gibbs Racing - or just the beginning of something more? 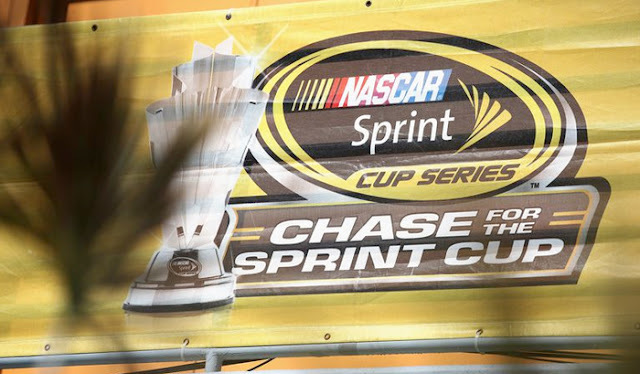 After a 12-year run with the sport, who will replace Sprint as the Cup Series sponsor? We won't have to wait long to find out - the 2017 Daytona 500 is just 95 days away. The checkered flag has waved on the 2016 NASCAR season. While it might be Jimmie Johnson hoisting the Sprint Cup trophy high, and we congratulate him and the No. 48 team, we feel like the true champions this year. From hometown hero Denny Hamlin's historic finish at the Daytona 500, to the exciting season finale during Fan Appreciation Weekend, to Johnson's record-tying championship win - it's been an incredible ride that we're thrilled to have shared with you. You said our races were some of the very best of the season, but we won't stop there. Our staff is hard at work planning an even bigger 2017, and we can't wait to share our plans with you. As always, our top priority will be making sure our fans have the unparalleled experience they've come to expect from a race weekend at your favorite short track. So as we wrap up the 2016 NASCAR season, one undoubtedly worthy of our incredible fans, we want to say Thank You one last time. I say it all the time: "We couldn't do what we do without you." This couldn't be clearer after a truly special season propelled by the loyal support of the best fans in sports. He did it in Talladega. He did it in Phoenix. Can he do it again in Homestead? 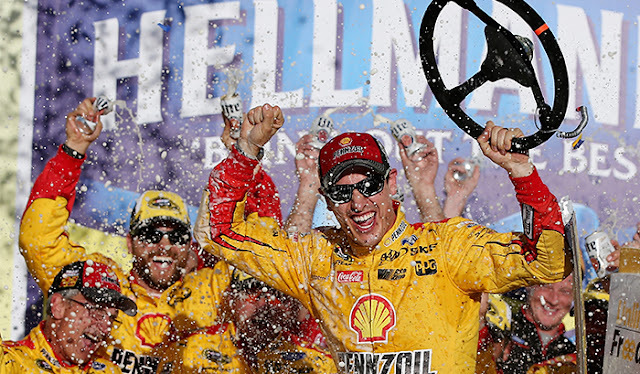 Joey Logano won his second straight elimination race with an overtime victory in the Can-Am 500, outracing Kyle Busch to the line and securing his berth among the Championship 4. 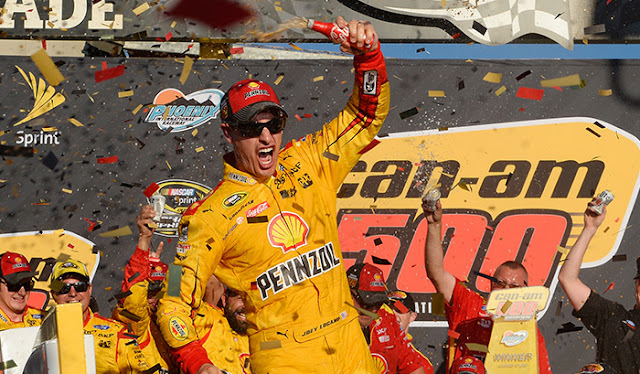 "This feels so good, I've never felt this good about a win before," Logano said. "There was so much on the line and everyone brings their A-game when it comes to winning championships and this team did it." 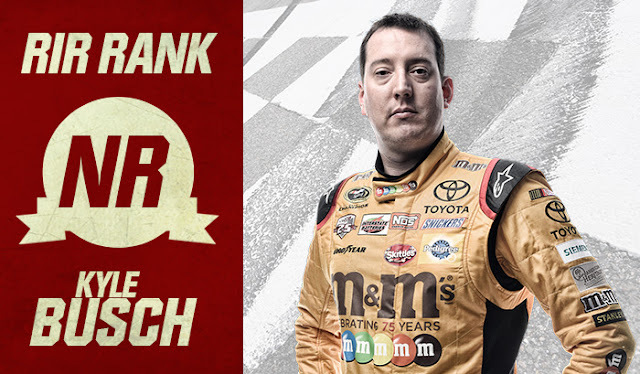 Busch's second place finish was strong enough to punch his ticket to Miami as well, where he and Logano join Carl Edwards and Jimmie Johnson as Championship hopefuls. But with Top-10's in five straight (and in all but two Chase races), Logano might be the hottest driver heading to South Florida. "We're racing for a championship now. We did exactly what we had to do. We've got to go to Homestead and do the same thing." 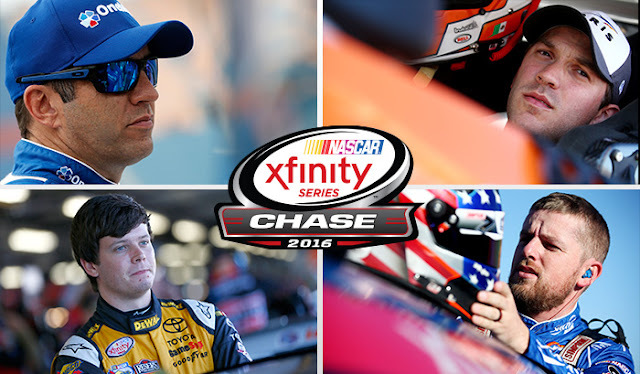 The inaugural XFINITY Series Championship 4 is set, with Daniel Suarez, Erik Jones, Justin Allgaier, and Virginia's own Elliott Sadler chasing the top prize. It all comes down to the two teams of Joe Gibbs Racing (Jones, Suarez) and JR Motorsports (Sadler, Allgaier) battling it out at Homestead-Miami on Saturday afternoon. Surprisingly, none of these drivers have claimed a Championship title yet - including Sadler, who has been thiiiiis close a number of times since running full time in the XFINITY Series since 2011. Personally, we'll be cheering on our hometown guy, but history will be made in any case. Only one race remains in the 2016 NASCAR season - the four-way battle for a Championship in Homestead-Miami Speedway. 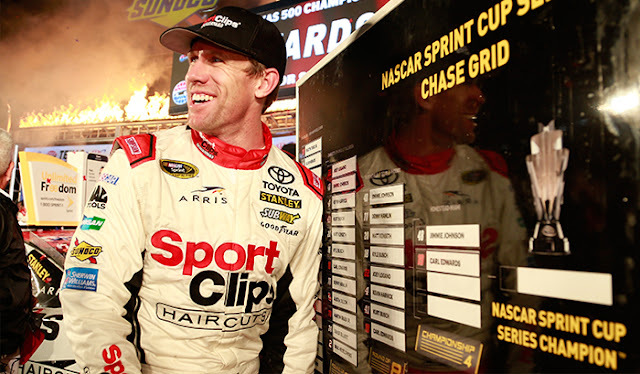 Can Carl Edwards, who's finished runner up to the likes of Johnson (2008) and Tony Stewart (2011), finally seal the deal and win his first title? 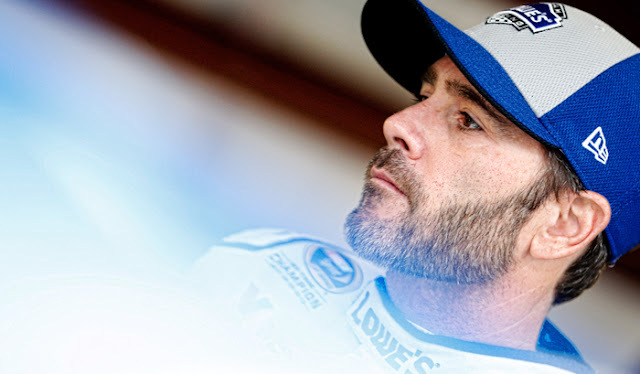 Will Jimmie Johnson add to his historic resume with a seventh Championship? Can Joey Logano, the youngest driver to compete in the Championship round, make Penske's 50th anniversary celebration extra special? Or will Kyle Busch become the first repeat champ in five years? You'll have to tune in this Sunday to find out. 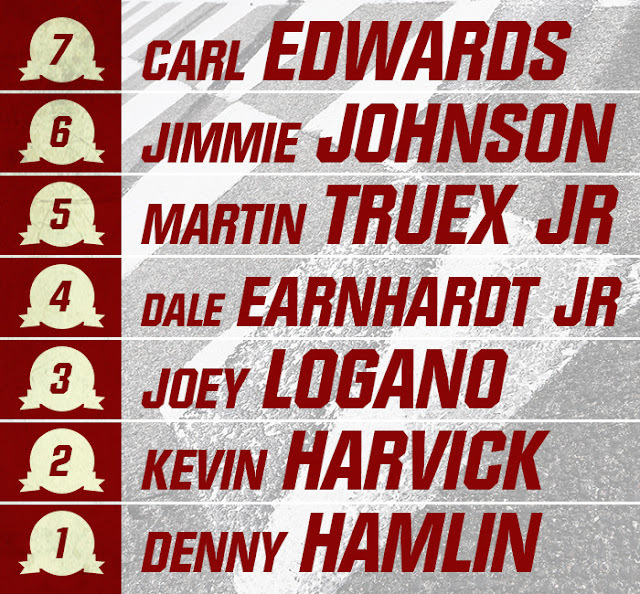 Just a couple days before the Daytona 500 kicked off the season, the RIR staff submitted their picks for the 2016 NASCAR Sprint Cup Champion. 13,531 laps, 35 races, 13 race winners and one Chase Grid later, we're down to just four drivers with a shot at the Championship. We won't be able to throw Denny Hamlin that hometown Championship celebration like so many of us had hoped, and even Martin Truex Jr's Philly fandom couldn't carry him to a title shot - but here's a quick look back at what we were saying nine months ago. This is Kyle Busch's second Championship 4 berth. Alright we goofed on this one. Not a single person on our staff thought the reigning champ would repeat as NASCAR's top dog, but an impressive 2016 campaign has the No. 18 thinking back-to-back. 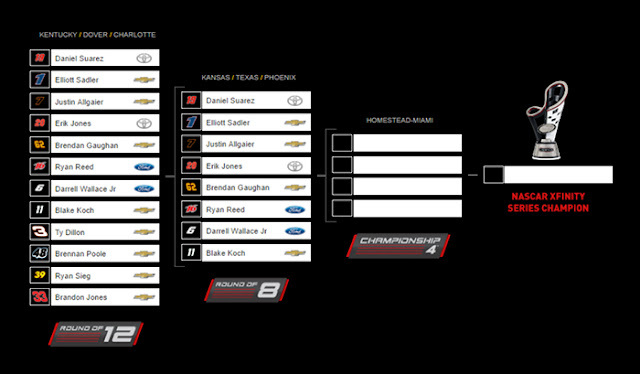 This is Carl Edwards's first Championship 4 berth. Year two with the JGR powerhouse has Carl Edwards humming into his second shot at a NASCAR Championship. This is Jimmie Johnson's first Championship 4 berth. While it wasn't the kind of dominating season we saw from Johnson during his six other Championship runs, he's definitely had his mojo of late. Half of his wins this season have come in the Chase. This is Joey Logano's first Championship 4 berth. The "youngster" in the group - Logano has been on a mission to overcome his early exit from the 2015 Chase. 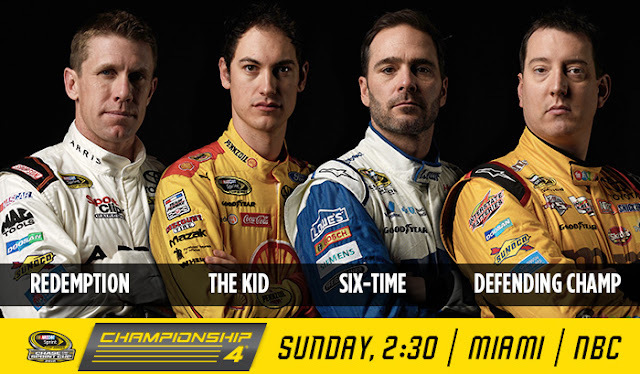 With wins in the past two elimination races, can he look to make it three in a row in Homestead? Make that a party of two. Carl Edwards will join Jimmie Johnson as one of the Championship 4 with a win in the rain-shortened AAA Texas 500, which ran only 293 of the 334 scheduled laps. Mother Nature struck at the right time and right place for Edwards to snag his third win of the season, and first since Richmond's TOYOTA OWNERS 400 in April. "We were in a bad spot if we went green again," said Edwards. "My car was starting to go away. I ran pretty hard there at the start, but man, that’s fun." Joey Logano had a strong day too - and solidified his chances of advancing to the Championship after leading a race-high 178 laps en route to a runner-up finish. 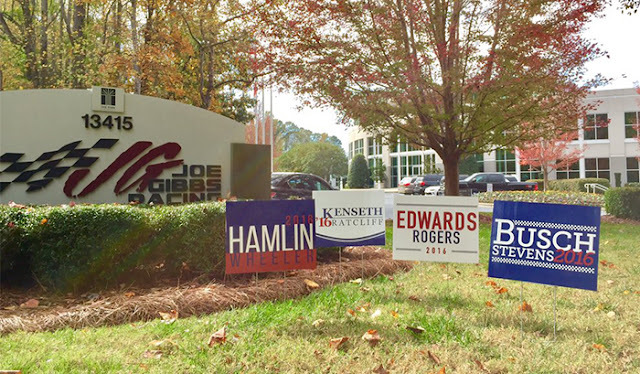 It's election season, and the folks over at Joe Gibbs Racing decided to have a little fun with it by throwing up a couple write-in suggestions for those undecided voters out there. And why not? With all four drivers still alive in the Chase for the Sprint Cup there's plenty of reason for optimism around the Huntersville offices. Although after his win on Sunday, there's a chance that Edwards and his crew chief Dave Rogers could be busy for the forseeable future. Speaking of voting - in a poll hosted by our partners over at FoxSports, fans think that Kevin Harvick has the best chance of joining Johnson and Edwards in the Championship round at Homestead. Considering the 2014 NASCAR Cup Champion has won six of the last eight races at Phoenix, he's certainly a heavy favorite. However, don't overlook the No. 22 Penske Ford either. 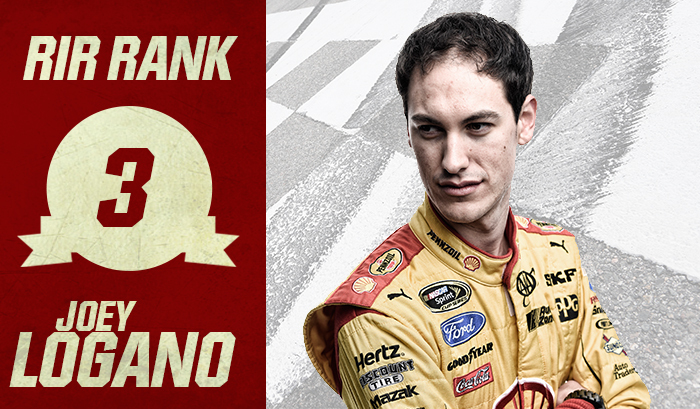 Logano finished third in last year's Quicken Loans 500, and i coming off a strong second place showing in Texas. The Joe Gibbs Racing Toyotas dominated much of the action in Martinsville. The trio of Hamlin, Matt Kenseth and Kyle Busch led a combined 227 of the race's 500 laps, and that number climbs to 374 if you include the performance of alliance member Martin Truex Jr. But it wasn't all sunshine and roses for the Short Track Squad. After running in the top-10 most of the afternoon, reigning TOYOTA OWNERS 400 champion Carl Edwards suffered a blown tire that put the No. 19 right into the Turn 1 wall. The wreck sent Edwards and the No.19 behind the wall for 24 laps, resulting in a 36th place finish for the Chase contendor. 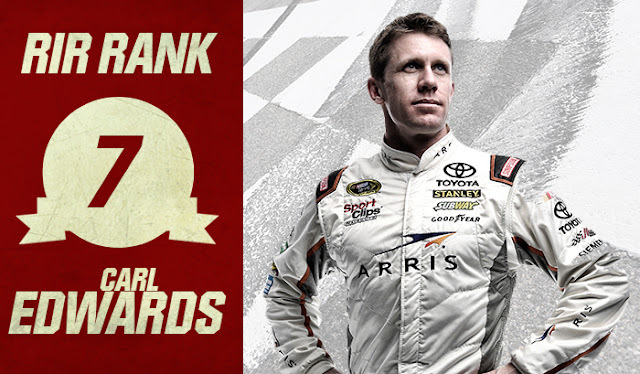 He'll need to put in some serious work at Texas and Phoenix if he wants to keep his championship hopes alive. After a two-week break, the NASCAR XFINITY Series will pick back up this weekend at Texas Motor Speedway. Two races remain before the series heads to Homestead-Miami Speedway, and Virginia's own Elliott Sadler is tied with NASCAR Next alumni Daniel Suarez for the Series lead. Blake Koch and Justin Allgaier round out the top four, but Erik Jones and Ryan Reed are in sitting within two points of Allgaier at P4. The sun has set on Martinsville, and as the Chase field veers out west for a pair of desert showdowns in Texas and Phoenix a gap has already formed among the eight remaining Chase drivers. A pair of poor showings from the Stewart Haas duo and tire problems for Edwards have all three sitting more than 16 points behind Kyle Busch in P4. But Edwards has three career wins in the Lonestar state, and Harvick can look forward to Phoenix, where the 2014 Champion has won six of the last eight contests. Someone's going to make some noise over the next couple of weeks - be sure to tune in and find out who. Gaulding meets with teammate Ricky Stenhouse Jr after Virginia529 College Savings 250 qualifying at his hometown track, RIR. At just 18 years old, Gray Gaulding has already had an impressive career in NASCAR, - and this weekend he's adding to it. The Virginia native will attempt to make his NASCAR Sprint Cup Series debut this weekend in the Goody's Fast Relief 500 at Martinsville Speedway, the first of three rides he's earned in the final four races of 2016. "It’s exciting to be making my NASCAR Sprint Cup Series debut at a track like Martinsville," said Gailding. "We’ve had a really good history here (so it's) honestly unfathomable." Gaulding enters the Martinsville field in the No. 30 Feed the Children Chevrolet for The Motorsports Group (TMG). He's also set compete at Phoenix International Raceway and in the season finale at Homestead-Miami Speedway. "We are pleased to sponsor Gray Gaulding, the youngest NASCAR driver in the Martinsville field and a promising and fierce competitor," said the Hon. J.C. Watts, Jr., president and CEO of Feed the Children. The youngster from Colonial Heights, VA started racing about as soon as anyone could. At just three years old he started his racing career on four-wheelers and dirt bikes, running at dirt tracks around the Commonwealth for seven years before giving stock car racing a shot. After winning four of the five Bandolero races he ran in his first season, it's safe to say he sunk it. Gaulding continued to impress through the NASCAR K&N ranks, setting a slew of records in the process. In 2013, Gaulding won the pole for the Blue Ox 100 right here at Richmond, making him the youngest pole-sitter in NASCAR K&N Pro Series East history at 15. A regular in the NASCAR Camping World Truck Series, Gaulding has a Sprint Cup ride for three of the final four races. 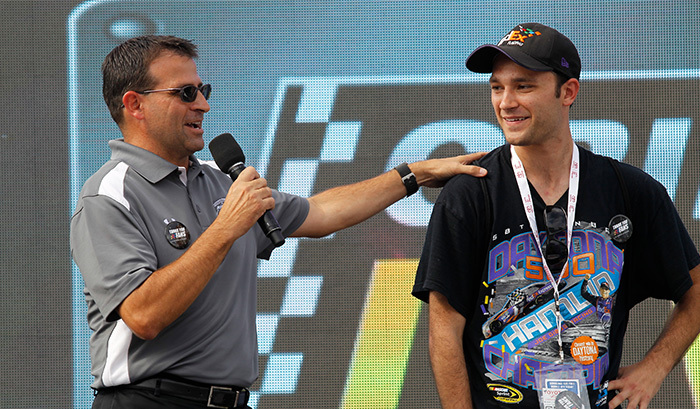 As an alumni of the NASCAR Next program (2013, 2014), NASCAR has recognized Gaulding’s talent at a young age. That promise has bore itself out over the past several seasons, where he's competed regularly in the NASCAR Camping World Trucks Series with NTS Motorsports, Red Horse Racing and Kyle Busch Motorsports. Earlier this year Gaulding was signed to Roush-Fenway Racing as part of their driver development program. He's competed in two NASCAR XFINTIY Series races this season, at Bristol Motor Speedway and Richmond, earning a 13th place finish in both races. This weekend in Martinsville is just another milestone in Gaulding’s notable career. While it'll be far from the last - it could be his most significant to date. 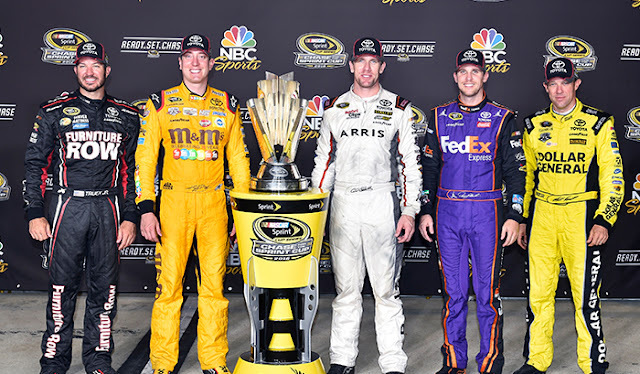 While their regular season dominance may not have yet shown itself in the Chase, Joe Gibbs Racing's quartet of Kyle Busch, Carl Edwards, Denny Hamlin, and Matt Kenseth still found a way to show why they're the team to beat. 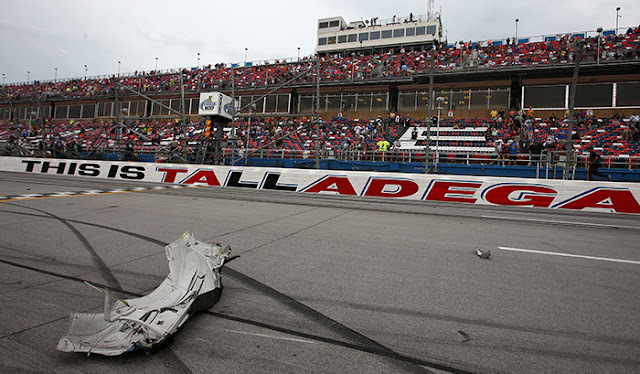 All four drivers have advanced to the next round of the Chase, without a single Chase win between them, thanks to some cautious race tactics at Talladega. “It’s a playoff and you’ve got to say what is smart and so you certainly don’t want to make a big mistakes of some kind and cost your sponsor and everybody that’s wrapped into this,” said team owner Joe Gibbs about the team's defensive strategy. Early today, NASCAR announced rules that will limit how many XFINITY and Camping World Truck Series races full-time Sprint Cup drivers can race in 2017. Drivers with more than five years of full-time Cup experience will be limited to maximum of 10 XFINITY and seven Camping World Truck Series contests beginning in 2017. Additionally, those drivers will also be held from competing in both Series' finales at Homestead-Miami Speedway and any XFINITY Dash for Cash races. 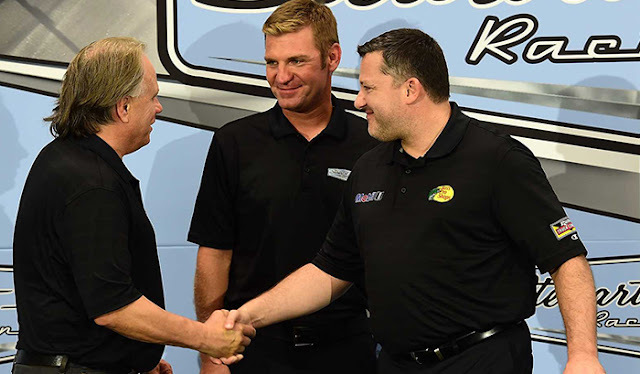 “The updated guidelines will elevate the stature of our future stars, while also providing them the opportunity to compete against the best in professional motorsports,” said NASCAR Senior VP of Racing Operations Jim Cassidy. The eight drivers who survived Talladega with championship dreams intact now turn their attention to Martinsville and the only short track in the Chase. Could this be where one of the JGR Toyotas, who've led 1,545 of the 3,307 laps raced on short tracks this year, captures its first playoff win? Hometown Hamlin was the last one to visit Victory Lane, winning the regular-season finale at Richmond International Raceway, and has five wins at the half-mile track. Teammate Kyle Busch also won at Martinsville in April, but it's Hendrick's Jimmie Johnson who has seen the most success in Southwest Virginia (eight wins, 23 top-10's in 29 races). It's been a whirlwind week for Yorktown's own Macy Causey. After a fast weekend in Martinsville where she became the youngest female to qualify for the ValleyStar Credit Union 300’s main field, the 15-year-old Causey jetted down to New Smyrna for the NASCAR Drive for Diversity Combine, a three-day showcase featuring some of the country's best and brightest drivers. "The combine was great. I thought I did very well and know I had one of the fastest times of the day," said Causey. "My confidence level on being invited into the program this year is very high - I think I impressed a lot of people with not only my ability on the track but off the track during my three days there." Causey was one of just 22 drivers from across the country invited to compete for a spot in Rev Racing's NASCAR Drive for Diversity Development program, which is renowned for providing talented young drivers with equipment, mentorship and opportunity. Her invitation to the 2017 combine marks the second time she's been involved in the program. When the Yorktown native was invited last fall, she was the youngest participant in NASCAR Drive for Diversity history at 14 years old. "It meant a lot to just be invited to the combine," said Causey. "At least 200 people apply and only around 20 are invited so it's really the opportunity of a lifetime. Last year really gave me another opportunity to build my confidence and I've done just that." 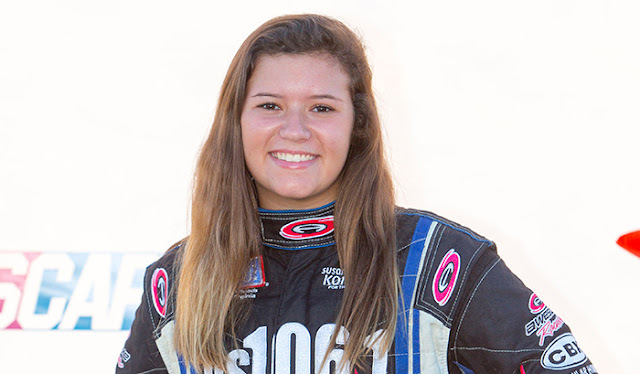 Causey competes regularly in the NWAAS Late Model Series - and although she calls Langley Speedway her home track, she's seen success racing in South Boston and the newly minted Dominion Raceway this season. She believes her performance and improvements have her ready to take the next step in her career, but knows the program would take it to new heights. "It would mean a lot (to be accepted)," said Causey. "I've worked hard these past few years in the late model cars, learning as much as I can. The opportunity to learn from (Rev Racing's) knowledge and take in what they have to offer - I think that's what will help me the most." While acceptance into the program would be an honor - breaking down barriers is in the Causey bloodline. Her grandmother, Diane Teel, was the first female driver to compete in the XFINITY Series nearly 40 years ago. 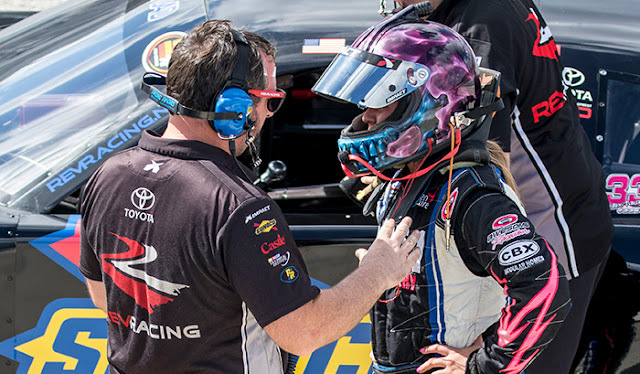 Teel has been integral for Causey's development as a driver, and she feels fortunate to have had tremendous support from her family. "My grandmother was the first woman to win a NASCAR race at Langley Speedway. Even though times and cars have changed, I still take her advice and look up to her." said Causey. "I'm really proud to carry the family tradition - I love racing and I think it's something I'll do for the rest of my life." The NASCAR Drive for Diversity program has helped produce some of the sport's budding stars, like 2016 Sprint Cup Chase competitor Kyle Larson as well as NASCAR XFINITY Series phenoms Daniel Suarez and Darrell Wallace Jr. It's run by Rev Racing, which is headquartered in Concord, North Carolina. Lock it in Kevin Harvick. The 2014 Champion will join Jimmie Johnson in the Round of 8 after a win in Sunday's Hollywood Casino 400 at Kansas Speedway. The No. 4 jumped in front of then-leader Carl Edwards on a late race restart, and held on through the final 30 laps for his fourth win on the year. "These races are hard to win and these guys are so good at the details," said Harvick, "When you put their backs against the wall they're even better. I'm so proud of them." Harvick has never been eliminated under the current Chase format, racing for a Championship at Homestead each of the past two seasons. Carl Edwards will just have to wait a little longer for a win at his home track, after losing the lead to Kevin Harvick on a late race restart. "That last restart Kevin and Jimmie (Johnson) just lined up on the bottom and they got far enough ahead to where I couldn't hang on the outside," said Edwards after his second place finish on Sunday. "And I ended up having to race Kyle (Busch) really hard there for a few laps and it let Kevin get out ahead." Rather than try and chase down the No. 4, Edwards spent the rest of the afternoon fending off Busch for the final 30 laps. "That's racing I guess," said Busch of the back and forth. This isn't the first time we've seen the JGR teammates race one another hard. Edwards famously bumped the No. 18 on the final lap of the TOYOTA OWNERS 400 at Richmond International Raceway to secure his second win of the season. It'd been nearly two years since the No. 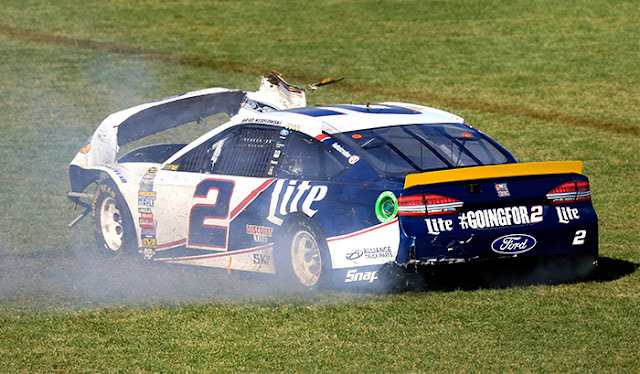 2 hadn't finished a NASCAR Sprint Cup event, but for the first time since the 2015 Daytona 500 Brad Keselowski suffered a DNF in Sunday's Hollywood Casino 400. Heading into the cutoff race in Talladega, the 2012 Champion is sitting 11th and eight points behind Joey Logano in the 8th position. On the plus side, Keselowski took home the May race at 'Dega, and is the only repeat winner in the last 11 races at the track. After a strong season racing on superspeedways (two wins in three races), he's got as strong a chance as any to race his way into the Round of 8. Five races down, five to go. We've reached the midway point in the Chase and there's plenty of intrigue as the postseason makes the turn down the backstretch. The Joe Gibbs Racing Toyotas, who were so dominant in the regular season, have been consistent but unremarkable through the Chase's first half. 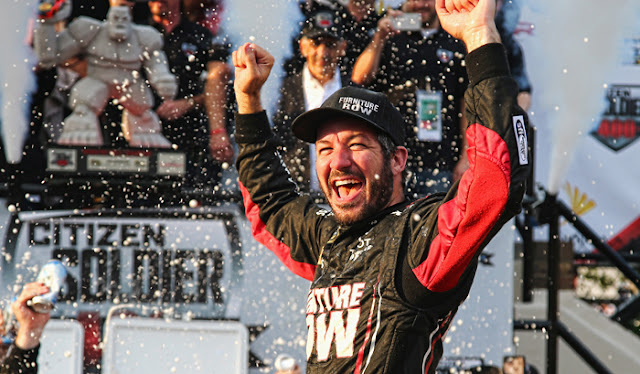 The only exception would be Martin Truex Jr, who is one of three Chase race winners we've seen along with former champions Kevin Harvick and Jimmie Johnson. Two of the Chase newbies are gone, and the two remaining are in danger of missing the cut come Sunday. The cutoff race in Talladega looms large as we move one step closer to crowning the NASCAR's 2016 Cup Champion. Virginia driver Elliott Sadler is in the middle of what might be his best season as a driver yet. "I hate that it's the first year of the Chase," Elliott Sadler said with a chuckle. "I mean I love it and think it's great for the Series, but I hate to give up a 47-point lead heading into the playoffs." At the time, Sadler was at Richmond International Raceway preparing for the Virginia529 College Savings 250 - the second-to-last race of the regular season. The Emporia, VA native sat atop the XFINITY Series standings in the midst of a season that will go down as one of his best. "I'd rather win at (Richmond) than anywhere else in the country," Sadler said of his hometown track. "I've got a lot of family and friends that come here for this race - it's really racing at home. Racing in our backyard puts so much emotion into it, it's a bucket list item for me." 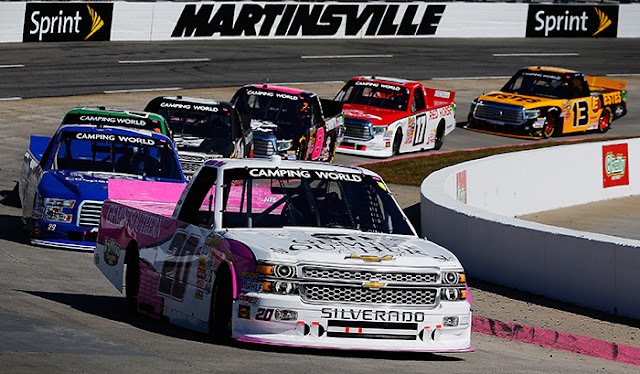 Although his fourth place finish in the Virginia529 College Savings 250 meant that elusive Action Track win would stay on that list at least a little longer, the JR Motorsports driver finds himself poised to check off an even bigger item. With just four races left on the XFINITY Series schedule, Sadler still sits atop the field as we move into the Round of 8 for the inaugural Chase for the XFINITY Championship. "We've had a dream season. I can't tell you how proud I am of Kelley (Earnhardt-Miller) and Dale Junior, the equipment they've given us, along with my crew chief Kevin (Meendering) and his guys," Sadler said. "We've just been bringing fast cars to the race track week in and week out. We've been very consistent, we're in the top-10 each and every week." Through 29 races he's finished sixth or better 18 times, posted three wins, and, aside from a mishap back at Charlotte in May, he's finished on the lead lap every race. 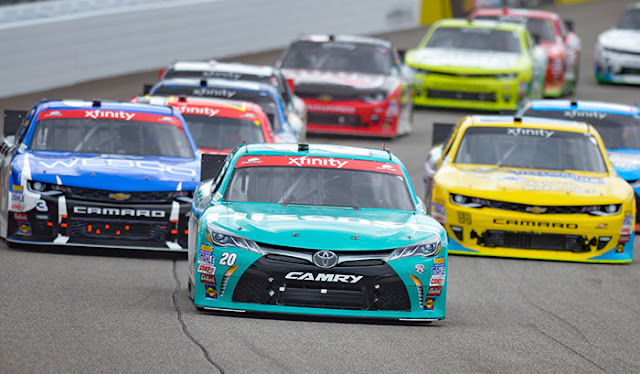 Had the XFINITY Series not adopted the successful Chase format like its counterpart Cup Series, the Virginia driver might've been a virtual lock for the 2016 XFINITY Series Championship. As it turns out, he's more than capable of rolling with the change, too. Sadler kicked off his postseason run in historic fashion, winning the first ever NASCAR XFINITY Series Chase race in Kentucky. The regular season points leader then followed up his win with a seventh place finish at Dover and a second place showing at Charlotte. The JR Motorsports driver has posted an average finish of 6.9 this season - the best of his career. "It's by far the best season I've ever had in racing," Sadler said. "We want to capitalize on it and I've got a great group of guys around us. We're just going to keep after it." 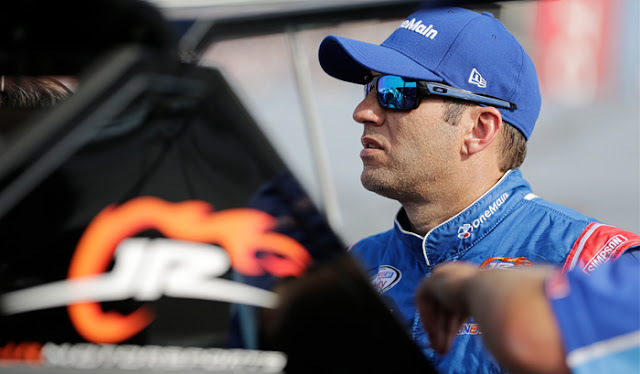 In his first season with JR Motorsports, Sadler enters the Round of 8 looking to extend his streak of 14-straight top-10's en route to a Championship showdown in Homestead-Miami. And while he claims it's his best season to date, whats even more important for the NASCAR vet is he's having the time of his life. "I like showing up to the race track every week knowing you have the chance to win, and I like appreciating the hard work that's going on around me," Sadler said. "I am in the best situation I've been in in a long time, I'm having more fun than I've had in a long time...I can't see myself doing anything different." Nor should he. As long as Sadler keeps doing what he's doing, there's a good chance he'll be bringing an XFINITY Series Championship to the Commonwealth. Think Sadler's got what it takes? Let us know! 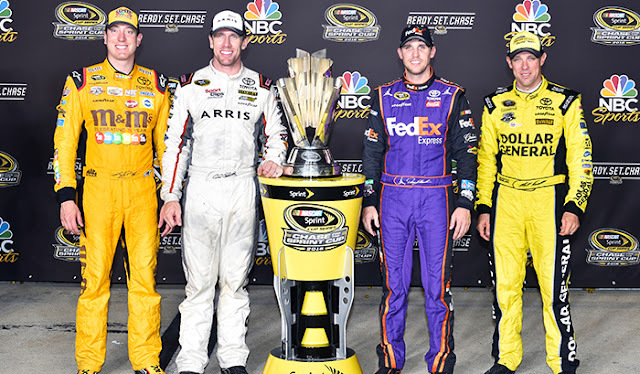 Pick Your Championship 4 and you could win a trip to the NASCAR Sprint Cup Series Awards in Las Vegas! It really was just a matter of time, wasn't it? 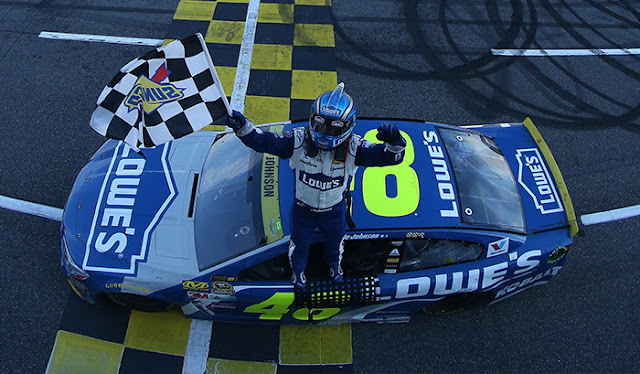 For the first time under the current Chase format, six-time champion Jimmie Johnson secured his spot in the Round of 8 with his eighth victory at Charlotte Motor Speedway on Sunday. "We knew we would get back," Johnson said in Victory Lane. "It was slower than we wanted it to be but to be here today and have this victory is great. We were able to execute all day long here. I just really can’t thank everyone enough that supports us and for all the fans that were tuned in today." 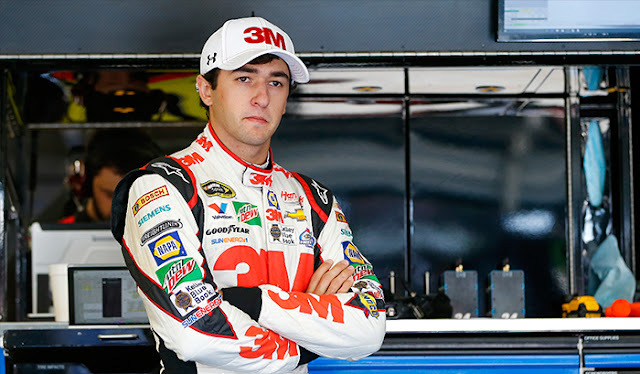 Johnson's teammate Chase Elliott was also poised for a strong finish in the 704, until a wreck on Lap 258 ended his day early. The Sprint Cup rookie led 103 laps and was running fifth when contact between Martin Truex Jr. and Austin Dillon caused a wreck that sent both the No. 3 and No. 24 into the garage. 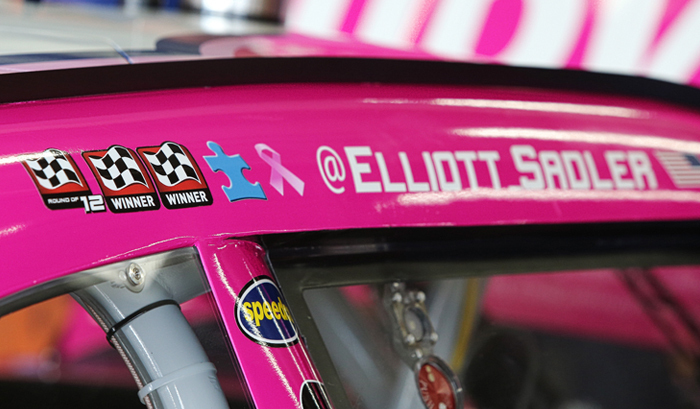 "We had such a good car and I am devastated that we didn't get the result that the guys deserved," Elliott said. "They gave me such a fast 3M Chevy and that is all you can ask for. We just have got to go and do more of that next week." Dillon and Elliott weren't the only two Chase contenders short on luck either. Drivers Joey Logano, Kevin Harvick and Denny Hamlin suffered car troubles that knocked them out of the race prematurely. Ty Dillon is out, Darrell Wallace Jr. is in - with just one point separating the two. 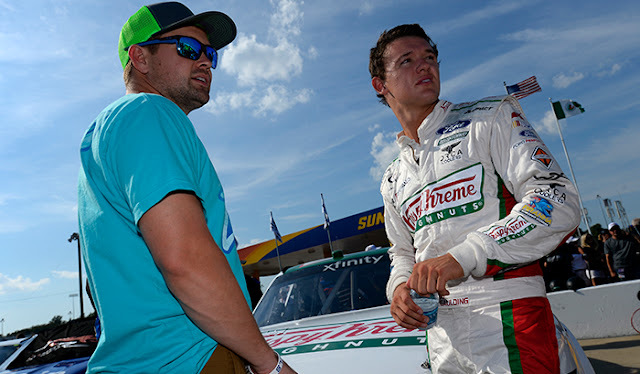 After a hectic race in Charlotte on Sunday, the inaugural XFINITY Chase field was cut to eight drivers and Dillon was one of four drivers who's championship dreams came to an end. "Man, it's heartbreaking," an emotional Dillon said after the race. "We're a team that should have been in the final round and you've got to expect things to happen...That's the way this Chase is built." Daniel Suarez and Emporia's own Elliott Sadler lead the remaining drivers, thanks to their respective wins at Kentucky and Dover. Fellow XFINITY race winner Erik Jones also made the cut, joining Wallace, Justin Allgaier, Brendan Gaughan, Ryan Reed and Blake Koch in the field. Think you know who'll make the next round of cuts? Make your picks here. Breathing Room? What Breathing Room? If Sunday showed us anything, it's that the notion of "breathing room" in the Chase might be little more than an illusion. 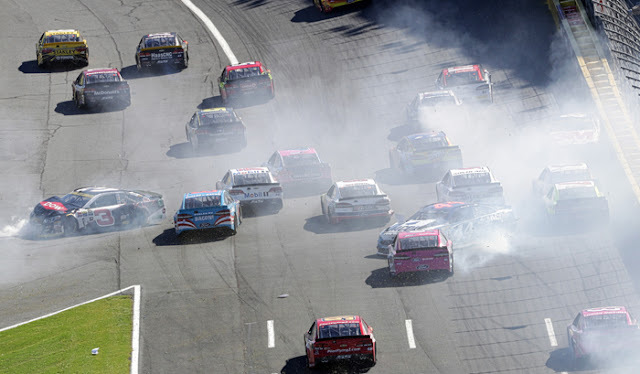 As 2014 champion Kevin Harvick pointed out last week - "trouble can strike anywhere." That certainly came to fruition in Charlotte when nearly half the Chase field was sent to the garage early. While nearly every driver had spoken about the importance of strong finishes at Charlotte and Kansas before cut-off race in Talladega, Sunday's contest proved to be an exhaustive gauntlet the entire field navigated all afternoon. Now the circus travels to Kansas City where there will be even more pressure for drivers to survive and advance in the 2016 Chase for the Sprint Cup. 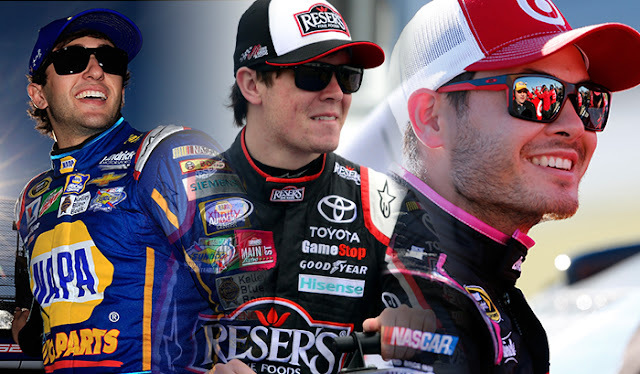 Ryan Newman, Martin Truex Jr., Chase Elliott? Under the current Chase format we've seen a driver weave their way into Championship contention on the backs of strong, consistent finishes. Although he's without a win in his rookie season - Elliott is not only hanging with the big dogs, he's thriving with them and advances comfortably in the Chase. 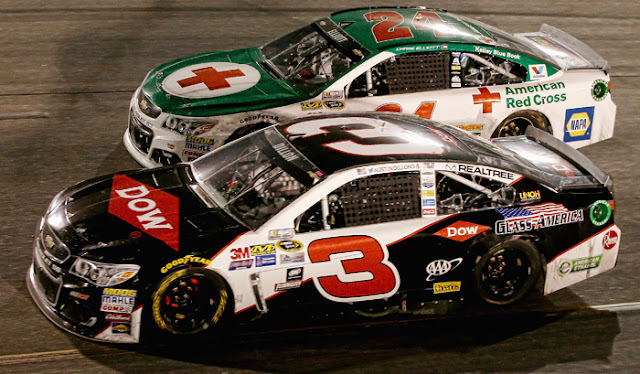 Fellow postseason newbie Austin Dillon raced his way into the next round with an eighth place showing at Dover, securing the 12th and final Chase spot. "It feels good," he said. "It's time to knock some more of these guys out, because we've got this opportunity. … I want to say that we're going to be the underdog in this next round, so let's go do it." Jeff Gordon found himself in a familiar place after 400 miles at Dover International Speedway, where a 10th place finish marked the 476th top-10 showing of his storied career. It was Gordon's best finish in seven races behind the wheel of the No. 88 Chevrolet, and the future Hall of Famer has just one race left on his calendar for 2016. "I wanted to get a top-10 in this car before my time in the car is over,’" Gordon said. "We got that. Now let’s go get a top five or something better at Martinsville." Considering the Virginia track is Gordon's best, odds are good that he will. While it was ultimately Truex who dominated the Chase's first round - it could've just as easily been Jimmie Johnson and the 48 in Victory Lane at both Chicagoland and Dover. A pair of pit road penalties saw possible victories slip away for the six-time champion, and those kind of mistakes will be even more costly in a tighter field. But with a combined 30 wins at the six tracks between here and Homestead, there's still time to put a stop to the costly mistakes and round into championship form. Make that two tickets punched to the Round of 12. Kevin Harvick joins Martin Truex Jr. as a lock to advance to the next round of the Chase for the Sprint Cup with his win in New Hampshire Sunday. Harvick overtook race leader Matt Kenseth - who was gunning for his third straight Loudon win - off the final restart with five laps to go and held on for his third victory of the season. 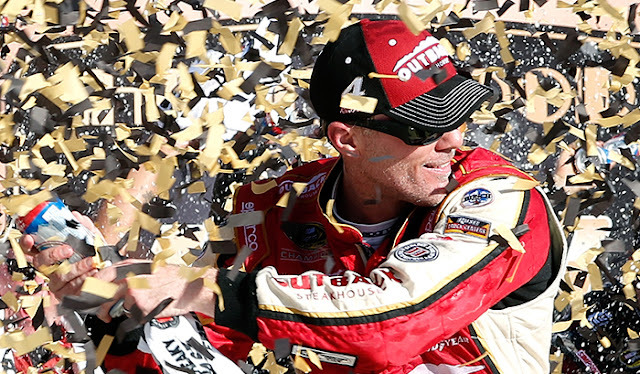 “For me, it was just a smooth restart,” Harvick said. “I just didn’t want to spin the tires. 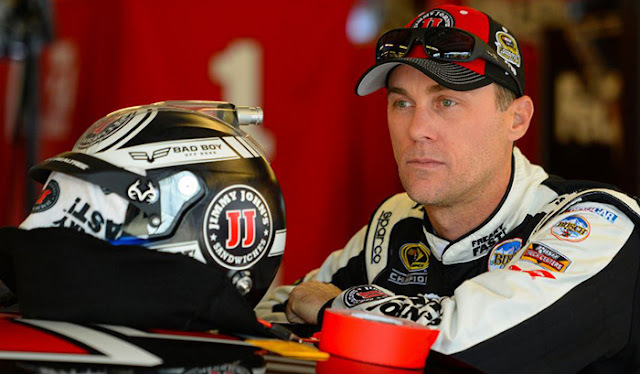 I feel like the performance of the car and the things that we’re doing are good enough to be competitive, and we just need to not make mistakes and go from there.” It was Harvick’s 34th career Sprint Cup Series win and second at NHMS, with his last coming in 2006. 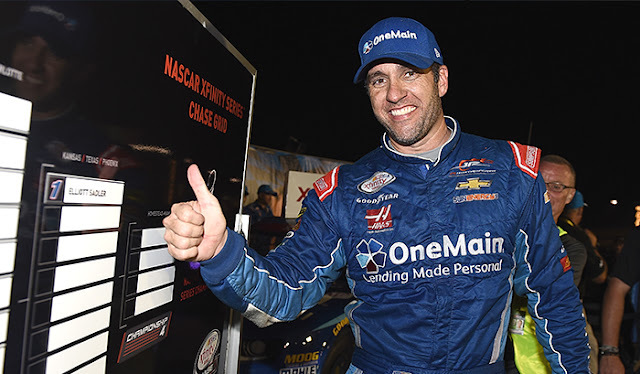 An emotional Elliott Sadler celebrated history over the weekend, becoming the first driver to win a race under the new XFINITY Series Chase format. "We fought through a lot tonight," Sadler said in Victory Lane. "I'm going to get a little emotional on you, I've been in the hospital all week with my mom in ICU watching her fight and fight through a lot of pain and suffering. (She) made her way back home tonight to watch the race. Mom, I love you. She leads so much by example." The Emporia, VA native expertly navigated his way through a caution-filled battle for the 13th win of his XFINITY career. The season's not over yet, but there's already been news of some big changes coming in 2017 with Stewart-Haas Racing front racing. Clint Bowyer will be behind the wheel of the 14 once the "Smoke" clears, and it'll be running on a Roush Yates Ford. NASCAR takes a look at these and a few other changes coming down the pipeline this winter. The field will get a little tighter after this weekend's race in Dover as four drivers will be eliminated from Chase contention. With two first-timers and a future Hall of Famer on the cusp of elimination, we could see some monster action at the "Monster Mile." Less than 20 points separate 7th-place Denny Hamlin from 13th-place Jamie McMurray, so don't be surprised to see some serious shake-ups before the Round of 12 is officially underway.